Ninh Binh (VNA) – Save Vietnam’s Wildlife (SVW), Cuc Phuong National Park and Hanoi Wildlife Rescue Centre (WRC) have successfully released 33 Sunda pangolins (Manis javanica) into the wild at an undisclosed secure site. SVW said late last week that the lucky pangolins were rescued from the illegal wildlife trade in August. After a month of care at SVW and Hanoi Wildlife Rescue Centre, they were released back into the wild in good health. SVW does not disclose the release locations of pangolins, due to the risk of the animals being located and recaptured by poachers. "This successful release was the result of hard work by WRC and SVW staff. We look forward to further successful releases in the future," the Director of WRC, Ngo Ba Oanh, said. Nguyen Van Thai, the Director of SVW, said sharing of skills and resources is a logical move for all those involved in rescuing these animals from the cruel illegal wildlife trade. According to SVW’s Head Wildlife Keeper, Luong Tat Hung, the collaboration between government run rescue centres, WRC, and SVW at Cuc Phuong National Park will help reestablish the critically endangered pangolin. Last month, 20 Sunda Pangolins were released into nature, thanks to cooperation between the Carnivore and Pangolin Conservation Programme, SVW and Cuc Phuong National Park. 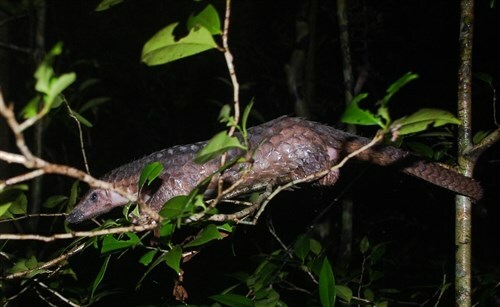 According to Save Vietnam’s Wildlife, 95 Sunda Pangolins confiscated from the wildlife trade were returned to the wild at safe locations this year. Pangolins are the most traded animals in the world. Vietnam has two species, the Sunda Pangolin and the Chinese Pangolin. Both are critically endangered, meaning they are in imminent threat of becoming extinct in the wild.